When the Core Team went birding this past weekend, we weren’t just looking for warblers. Rumor had it that sparrows beyond the typical House and White-throated varieties could be found lurking about Central Park. Like 99.99% of the population, we have trouble distinguishing one little brown job from another, but that doesn’t stop us from trying. Our moment of truth arrived as we rambled through the Ramble. A striking white-throated sparrow, marked as boldly as the one in my picture above to the left, trotted out of the underbrush and called for our attention. No sooner had we looked than another sparrow, much different in appearance, landed right next to the white-throat. This sparrow, whose image is recorded for posterity above to the right, shared some marks with the white-throat, notably yellow lores. However, it was far more drab, with brown stripes on its crown in place of black and a tan, rather than white, eye stripe. At last, a new sparrow! Identification was difficult, since this sparrow didn’t match up comfortably with any of the other potential species. That’s not to say that this bird was by any means furtive or flitty. It preened and posed at our feet for a full five minutes. It basically did everything except fly into our mouths so we could ID it by taste. Yet, we couldn’t close the deal. It was too much like a white-throat to be anything else, but too distinct to possibly be the Zonotrichia albicollis that we see everywhere from December to May. Perhaps, we wondered, it could be a Savannah Sparrow. It shared the same yellow lores, median crown stripe, and goatee-like black malar markings. Best of all, we’d never seen one. The ID didn’t sit right with us, so once we downloaded our pictures for the day, I deployed the big Sibley Guide to Birds, a more extensive volume than the Sibley Field Guide to Birds of Eastern North America we carried around with us. After a little research, the horrible truth dawned on me. 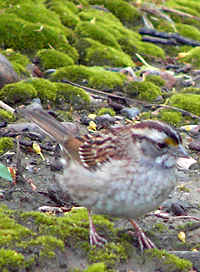 There are two different forms of white-throated sparrows! Although we are used to seeing the White-striped white-throats, some of these birds may be Tan-striped white-throats. The tan-striped birds are considerably more drab than their white-striped, white-throated brothers and sisters, but still the same species. See why sparrows are so much trouble? 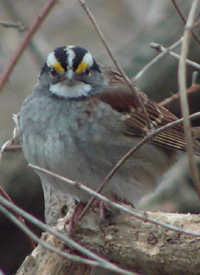 I saw my first tan-striped white-throated sparrow today after 50 years of birding. Your photo is terrific, and I enjoyed reading your story of seeing and ID’ing it. Thanks for sharing!